The gun grabbers in Madison are joining together to stop Constitutional Carry. We knew this was coming. Anti-gun forces are scared of the political tide that has shifted in our direction. That’s why they are working hard to stop us! 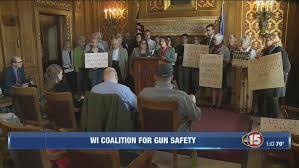 They have created a new coalition of gun control advocates — calling themselves the “Wisconsin Coalition for Gun Safety” –- and they are hell-bent on stopping our progress here in Madison. We already have Michael Bloomberg-funded front-groups pouring money and resources into our state in an effort to kill Constitutional Carry. And now Wisconsin anti-gun forces are mobilizing with him! However, the Wisconsin Firearms Coalition is mobilizing gun owners across the state to combat these anti-gun radicals. We’ve been busy at the Capitol, signing up gun owners at gun shows, and we’re working to spread the word on social media about Constitutional Carry — which is ground zero for the gun rights battle in Wisconsin. And we are proud to have you standing with us in this fight! But now is not the time to sit back and see if weak kneed politicians will cave to the Wisconsin Coalition for Gun Violence. In other states where these big gun rights battles have taken place, we have seen Bloomberg fail time and again. Last year Bloomberg and his anti-gun front groups tried to kill Constitutional Carry in states like Idaho and Missouri, and this year they failed to stop “Stand-Your-Ground” in Iowa. He failed when local gun groups stood up to him and stood up to the establishment politicians! Now is our chance. Now is your chance. This is the time that gun owners in Wisconsin have to step up. We have to ensure that our gun rights are protected. As you may already know, the State Affairs Committee in the Assembly will be hearing Assembly Bill 247 (Constitutional Carry) in the near future. The anti-gunners are already calling these committee members to tell them to kill this bill. And our political insiders tell us that some members of the committee are already thinking the bill may be too extreme! Constitutional Carry is not “too extreme,” and we need to make sure they know that. >>> First, we need you to reach out to every committee member and tell them to vote for Assembly Bill 247, with no weakening amendments. Make sure to call, email, and contact them on Facebook. Feel free to do all three, they need to hear from you loud and clear. >>> As these anti-gun groups join forces to stop Constitutional Carry and push their anti-gun bills in Madison, we need you to stand with us. Some people are becoming Lifetime Members or Gold Members of the WIFC and we would be honored to have you join as well. But if you can’t quite do those levels yet, then we also sincerely appreciate our Silver and Bronze level members. Whatever level you join at, you are sending a message loud and clear to the anti-gunners that you stand on the side of gun rights! Anti-gun activists are bitter about the elections and the progress the Second Amendment is making all over the country, and they are determined to stop that advance right here in Wisconsin! Please help us fight back, by contacting the State Affairs committee members today and telling them to advance Constitutional Carry with no weakening amendments. Their contact info is listed above. Then, please consider joining the WIFC today at whatever membership level is right for you!